Benefit, B. R. and M. L. McCrossin. 1993. The lacrimal fossa of Cercopithecoidea, with special reference to cladistic analysis of Old World monkey relationships. Folia Primatologica 60:133-145. Disotell, T. R. 1994. Generic level relationships of the Papionini (Cercopithecoidea). American Journal of Physical Anthropology 94:47-57. Disotell, T. R. 1996. The phylogeny of Old World monkeys. Evolutionary Anthropology 5:18-24. Disotell, T. R., Honeycutt R. L., and M. Ruvolo. 1992. Mitochondrial DNA phylogeny of the Old World monkey tribe Papionini. Molecular Biology and Evolution 9:1-13. Harris, E. E. 2000. Molecular systematics of the Old World monkey tribe Papionini: analysis of the total available genetic sequences. Journal of Human Evolution 38:235-256. Harris, E.E. and T. R. Disotell. 1998. 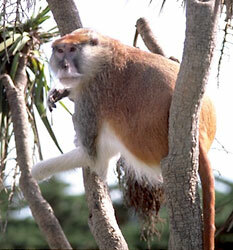 Nuclear gene trees and the phylogenetic relationships of the mangabeys (Primates : Papionini). Molecular Biology and Evolution 15:892-900. Harrison, T. and E. E. Harris. 1996. Plio-pleistocene cercopithecids from Kanam East, western Kenya. Journal of Human Evolution 30:539-561. Jablonski, N. G. (ed.) 1993. Theropithecus: the Rise and Fall of a Primate Genus. Cambridge University Press, Cambridge. Jablonski N. G. (ed.) 1998. The Natural History of the Doucs and Snub-Nosed Monkeys. 15th International Primatological Society Congress (1994: Bali Island, Indonesia). World Scientific, Singapore. Page, S. L., C. H. Chiu, and M. Goodman. 1999. 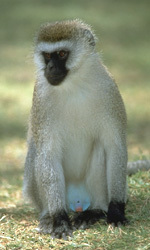 Molecular phylogeny of old world monkeys (Cercopithecidae) as inferred from gamma-globin DNA sequences. Molecular Phylogenetics and Evolution 13:348-359. Purvis, A. 1995. A composite estimate of primate phylogeny. Philosophical Transactions of the Royal Society of London Series B 348:405-421. Van der Kuyl, A. C, C. L. Kuiken, J. T. Dekker, and J. Goudsmit. 1995. Phylogeny of African monkeys based upon mitochondrial 12S rRNA sequences. Journal of Molecular Evolution 40:173-180. Whitehead, P. F. and C. J. Jolly (eds). 2000. Old World Monkeys. Cambridge University Press, Cambridge. 528 pp. Zhang, Y. P. and O. A. Ryder. 1998. Mitochondrial cytochrome b gene sequences of old world monkeys: With special reference on evolution of Asian colobines. Primates 39:39-49. Cercopithecidae. The University of Michigan Museum of Zoology Animal Diversity Web.